These are simply sensational, and not that much bother to make. 1 For the tomato sauce, put olive oil and garlic in a medium-sized saucepan over gentle heat. Cook for a few minutes until garlic just starts to change colour. Carefully tip in tomatoes, season with ½ a teaspoon of salt and a little black pepper, then bring to a gentle boil. Lower heat and cook sauce for 30 minutes, stirring often, until thick and pulpy. 2 For the galette, thaw spinach in a microwave, cool, then wring out as much moisture as possible with your hands. Chop finely. In a bowl, beat eggs with a fork, add spinach, milk and ½ a teaspoon of salt and black pepper to taste. 3 Preheat oven to 190°C (375°F). Heat a small omelette pan and when it is nice and hot drop in a knob of butter. When butter is sizzling and just threatening to burn (but don’t let it! ), add a small ladleful of spinach mixture. Cook until golden, then turn pancake carefully with a palette knife and cook other side until golden. Repeat to make 10 pancakes in total, heating a little more butter in the pan before cooking each one. 4 Have ready a shallow ovenproof dish that is large enough to hold 2 stacks of pancakes and line with baking (parchment) paper. 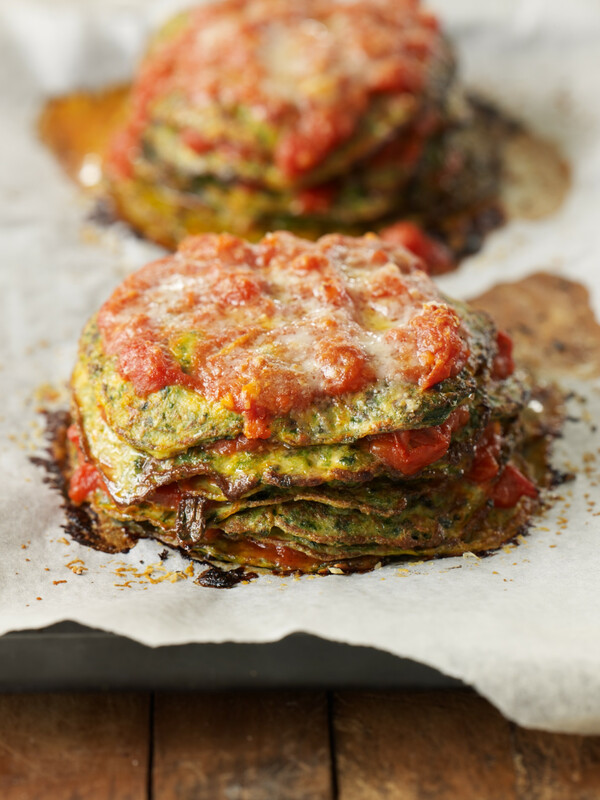 When all pancakes are done, layer them in the ovenproof dish with the tomato sauce, cheese and basil making 2 stacks: put in the first two pancakes and spoon chunky tomato sauce over each, sprinkle with a little cheese (keep plenty for the top), add a few basil leaves and grind over a little black pepper. Repeat layers until there are 5 pancakes in each stack. Spoon a little more sauce over each stack, sprinkle with cheese and dot with a little butter. 5 Cook for about 15 minutes in preheated oven, or until golden on top and bubbling around edges. To serve, cut stacks into quarters like a cake. You might be tempted to take a short cut and use an already prepared tomato sauce, but the sauce here is so easy, and will cost a quarter of the price of one from the supermarket – and, importantly, I reckon, you’ll know what’s in it if you make it yourself! If you are looking for a wine match, I’d definitely serve a red – either a medium weight cabernet sauvignon or a cabernet merlot blend.